The Hickory Patio Lounge Chair Cover from Classic Accessories is made from durable Weather10 material featuring a rugged fabric outer layer with a laminated waterproof and wipe-clean inside coating. Weather Leather trim looks authentic but wont. 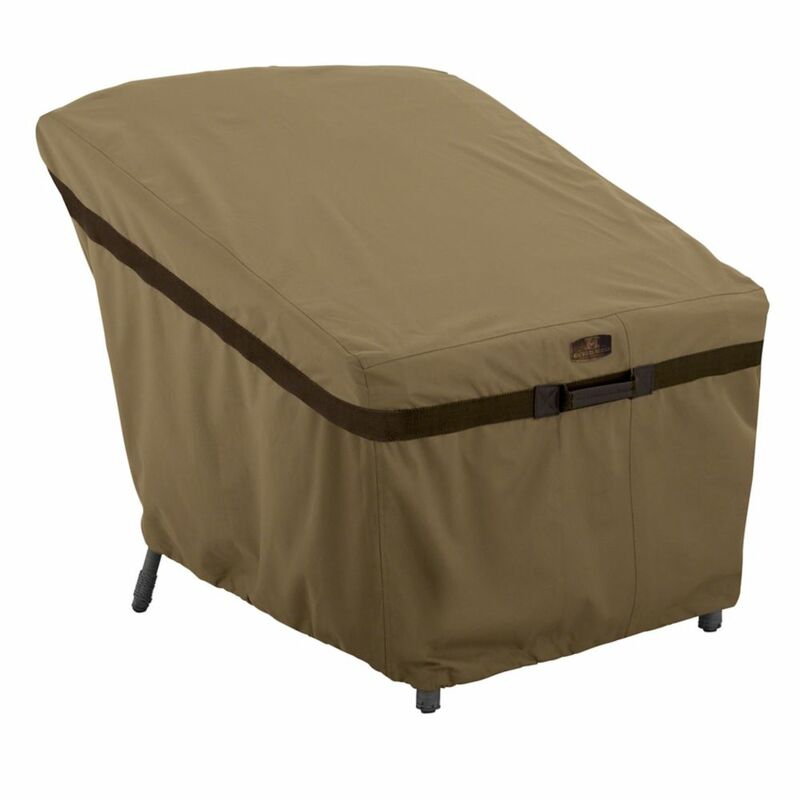 Covers patio lounge chairs up to 33.5 L x 38 W x 31 H.
This Hampton Bay cover protects outdoor furniture from dust, dirt, sun, rain and heavy snow. The heavy duty Rip-Stop fabric is durable and will protect your patio furniture for years to come. With elastic and adjustable buckles on the bottom straps, these quickly secure to the furniture legs, so your cover stays on during windy days. This cover fits up to 84 -inch L x 84 -inch W x 30 -inch H.
Hickory Patio Chair Cover - Lounge The Hickory Patio Lounge Chair Cover from Classic Accessories is made from durable Weather10 material featuring a rugged fabric outer layer with a laminated waterproof and wipe-clean inside coating. Weather Leather trim looks authentic but wont. Covers patio lounge chairs up to 33.5 L x 38 W x 31 H.
Hickory Patio Chair Cover - Lounge is rated 4.9 out of 5 by 11. Rated 5 out of 5 by Heather from Excellent quality and tough material These covers look nice, have practical tie-downs and nice looking leather-like handles. The material is very substantial and should keep out all the elements, the breathable mesh is a clever addition. Rated 5 out of 5 by Tracy from Worth the extra money I bought cheaper covers but they didn’t hold up. Bought two of these 2 years ago still going strong so bought 2 more. Very durable and keeps chair cushions dry. Rated 5 out of 5 by Coyote from Great patio furniture covers I have tried a couple other brands and these are by far the best for fit, sun protection, water repellent and ease of covering the furniture. We bought our first set and liked them so much bought a second set for our other outside pieces. Rated 5 out of 5 by CarolADK from Excellent quality Very easy to put on and off the chair with sturdy handles. Excellent quality and fit. Rated 5 out of 5 by Brian from Great quality We bought these patio chair covers and are more than pleased with the fit and the quality.